The YWCA Canberra Clubhouse is a free, out-of-school learning space that connects young people in Tuggeranong with access to the latest in technology, and the mentoring and support needed to grow their skills in science, technology, engineering, arts and mathematics (STEAM). 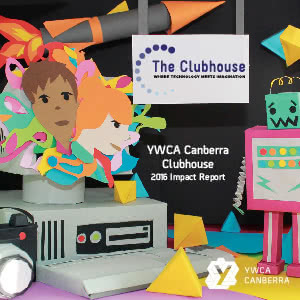 In the 2016 YWCA Canberra Clubhouse report, you can meet our Clubhouse members, hear from our Clubhouse Ambassadors and learn more about the important outcomes that have been achieved for young people at the program over the past 12 months. Highlights include a substantial increase in Clubhouse membership, the Big Picture Project which supported Lake Tuggeranong College students to attain their year 10 certificates, special girls-only robotics workshops, and a new youth leadership program. To read the full report, download a copy now. You can also follow the Clubhouse on Facebook, Twitter and the Clubhouse Blog for regular updates on what’s happening at the program. For more information on how you could become a Clubhouse mentor, partner or ambassador, visit the YWCA Canberra Clubhouse website.